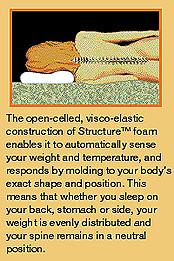 their Memory Foam Mattress Topper (Structure Mattress Pad), by Isotonic, to review. Burn Survivors, other individuals who were injured and many people in general have problems sleeping due to pain, emotions, sleep disorders. This causes them to not get the proper amount of rest. When a person moves around in bed the relaxation of his/her sleep is not at the highest value. It has been seen that most mattresses fail to properly support your body's spine. The result can increase pressure on different parts of your body. Today Isotonic, a leading manufacturer of foam products, has engineered the visco-elastic foam material that is the key to the Memory Foam Mattress Topper. Here is some background on the Memory Foam. The open-celled construction of the Structure enables it to automatically sense the weight and temperature of the bodies on it. It then responds by molding to your body's exact shape and position. That helps to reduce the stress on your body's pressure points; shoulders, hips and legs. By doing so the other parts of your boy are more relaxed and it can help to lower the pain you are suffering from. After reviewing the Memory Foam Mattress Topper, BSTTW has concluded that it is an excellent investment in the recovery process for burn survivors and others that have been injured. Individuals with back pain, insomnia, arthritis, headaches, etc. can also benefit from this product. We also feel that it is something that others in your family may want to try and see if they will have a better night sleep. The individuals BSTTW has had sleep on this product stated that after sleeping on their, back, stomach and side, they slept through the night and woke up more relaxed and in less pain than before. They also stated that after having such an enjoyable sleep they felt more energetic. Currently in 2019 TechnoScout Memory Foam Mattress Topper is no longer available. Current affordable 3 and 4 inch twin through king memory foam mattress toppers prices range from $48.49-$178.19. For more information and pricing on Memory Foam Mattress Toppers and other products go to Smile Amazon: Memory Foam Topper (At Smile Amazon you can request to donate a % of your purchase to Burn Survivors Throughout The World, Inc.) or Walmart: Memory Foam Topper.